Will the Affordable iPhone 5C Make Apple Number One in China? Analysts predict success for iPhone 5C in China, Apple stock forecasts increase. Almost a year after releasing the iPhone 5, Apple is expected to release two new iPhone models at a September 10 press event – a (possibly gold-colored) successor to the high-end iPhone 5, likely to be called the iPhone 5S, and a budget iPhone with a plastic casing that has been dubbed the iPhone 5C. This more affordable version of the iconic iPhone may become a catalyst for boosting Apple’s market share in China. It could also propel Apple’s stock price and line the coffers of company investors. Earlier this week, Morgan Stanley analyst Katy Huberty shared the results of a Chinese consumer survey with bank clients. Huberty’s team polled Chinese mobile phone owners about their interest in purchasing a new iPhone and how much they would be willing to pay. The results indicated that with a cheaper version of the iPhone, Apple could become China’s leader in smartphone market share. “iPhone 5C could increase Apple market share by 13 points in China, with the largest share losses at Samsung, HTC, and Nokia, according to our July AlphaWise survey of 2,000 Chinese handset users in tier 1-2 cities. While a formal China Mobile relationship is less certain, it could add another 6 points of share, allowing Apple to take the smartphone share lead,” said Huberty’s note to investors. Huberty also asserted that Apple has experienced the largest jump in repurchase rate among major handset vendors. Android-powered phones by Samsung and others could be forced to reconsider pricing in order to compete with an iPhone 5C. Yesterday, market research firm UBS stated that Apple’s stock price could soar by more than 10 percent following the release of the iPhone 5C. UBS has also raised Apple’s stock price target from $500 per share to $560, with earnings per share at roughly $44.65 for 2014. That figure could rise to $48.45 for fiscal year 2015. The positive outlook for Apple’s iPhone 5C comes at the same time as new leaked images emerge. 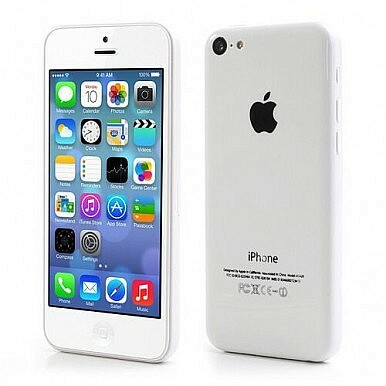 GSM Arena posted an alleged press photo of a white iPhone 5C alongside shots of a purported dummy model that could be used in store displays. A new report says the long-standing dispute between China’s largest carrier and Apple is coming to an end. It Only Costs Apple $199 to Build an iPhone 5s, $173 for 5ciPhone 5s Expected to Sell Out on Launch DayiPhone 5C and Moto X: Are These “Budget” Handsets Too Expensive?Apple Unveils iPhone 5C and iPhone 5S at Cupertino HQWill New iPhone Help Apple Challenge Android’s Dominance?